Behind the Scenes with Fitzroy Books’ writer, Bonnie Graves. The question most often asked of authors is “Where do you get your ideas?” Truth is you get them from everywhere—from life—yours and others’—from reading, from your cat, your dog. You get the idea! Usually when people ask me where the idea for particular book came from there’s no one thing I can point to and say, “This is where the idea came from. This is where it started.” But with Catch Me When I Fall, I can tell you exactly. 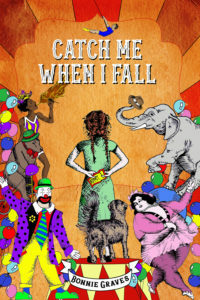 The spark of an idea for Catch Me When I Fall came after reading an uncle’s memoir about his experiences as a young boy watering the elephants for a traveling circus in hopes of earning a ticket to the Big Show. The anecdote was so rich in detail and humor it just begged to become a story. I didn’t feel I could write it from a boy’s point of view, the way my uncle had, so I needed a heroine, someone brave enough to dress as a boy to get a circus job, someone who desperately needed that circus job. That someone turned out to be 12-year-old Emma Monroe, a spunky red-head, who’s determined to learn the identity of her father, the man her mother refuses to talk about. The acclaimed author Virginia Hamilton once wrote, “Writing is what you know, remember, and imagine.” Well put, I think. Much about Emma and her mother I drew from my own childhood. When I was nine, my father drove our family—my mom and two siblings—out to California to his brother’s family where he left us—and returned to Wisconsin—to be with his lover. He was never spoken of again, by anyone. It was as if he’d never existed. My sibs and I all knew that speaking his name was taboo, forbidden and even, to a kid, dangerous. So, I suppose, in a way, writing the story was an exploration of this childhood trauma, one that had remained forever in the shadows. Emma’s story, in a way, would help bring it into the light. “Writing is what you know, remember, and imagine.” I knew and remembered what it felt like to be fatherless and could “imagine” how a gutsy (even though I was anything but gutsy) twelve-years-old girl might go about searching for her father. 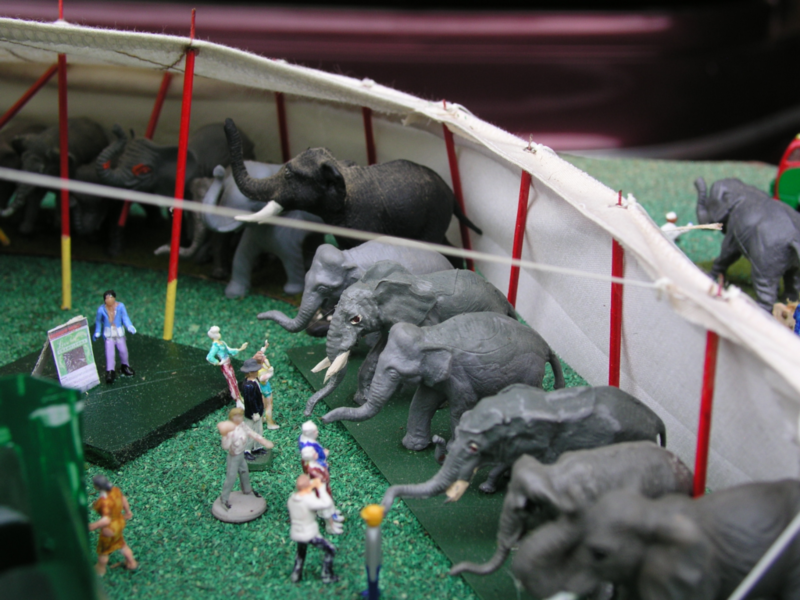 However, since the story is set during the Great Depression and most of the action takes place in a traveling circus, I couldn’t rely on just my own experience and knowledge of the world, or even my own imagination but had to do reams of research—on life in the 1930s and the ins and outs of the traveling circus. I had to discover things I didn’t know but needed to, in order to make the story come to life, to be as accurate a portrayal of the times and of the circus as I could. Of course, that meant hours and hours in the library and researching the internet for articles and images of the 1930s and the circus during that period. I had a special notebook where I kept my research over the many years. The divider tabs read: Photos, Flying Trapeze, Descriptions, Essay, and 1930s. 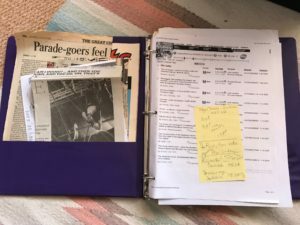 The photo here shows the first page of the notebook—a library search I did for circus books and a page from the Descriptions section of the setting up of the circus. 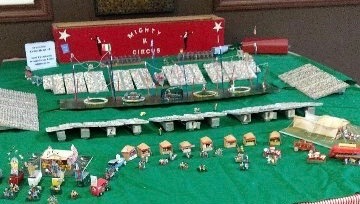 Some of Ned’s models that were so helpful in visualizing the circus are shown above and below. 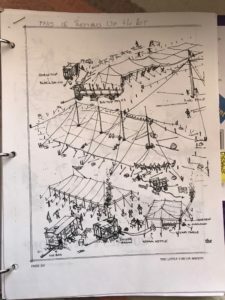 Since the story is set in Racine, Wisconsin, the Wisconsin History Society was a great help as were the circus folks I met over the internet, especially aerialists like Laura Rappa and Lindsay Van Voorhis and circus historian and model maker Ned Kronberg. “Known, remembered, imagined.” Once I’d immersed myself in the 1930s and circus life through extensive research, I could begin imagining what it was like to be a young girl living during that time, to experience the thrill of the circus, the sights—the breathtaking aerialists, the parade, the midway; the sounds—calliope, trumpeting elephants, roaring tigers; the smells—animals, hay, sawdust—all through the wonderful world of imagination which had been fueled by the research I had done. 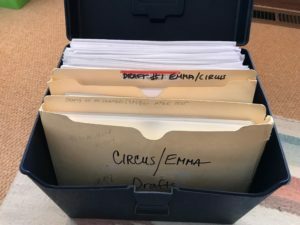 Over the years, Emma’s story went through countless revisions that were stored in binders and in file boxes. One of those boxes is shown here plus a few of the binders that I kept on my circus shelf. Yes, indeed, writing is, as Virginia Hamilton suggests, “what you know, remember, and imagine.” It is also something not done totally alone, at least not for me. Just as it “takes a village to raise a child,” so does writing and publishing a book—which at times does feel like one’s child! Catch Me When I Fall had one of those villages behind it—a village of people who helped with research, writer friends who read and critiqued the manuscript and gave valuable feedback, friends and family who gave support over the long journey to publication, and finally editor-publisher Jaynie Royal at Fitzroy Books who took a chance on my valiant young protagonist Emma and introduced her to the world with the publication of Catch Me When I Fall. Thank you all—my village! 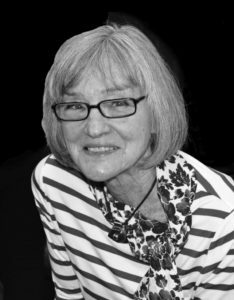 Author of dozens of children’s books, both fiction and non-fiction, and professional books on teaching reading, Bonnie Graves spent her growing-up years in Wisconsin and Southern California. Here she romped through childhood with her boy cousins and their pals and in her preteen years wrote and produced plays for family and neighbors. A former elementary school teacher, Bonnie’s work has been honored with Work-in-Progress grants from the Society of Children’s Book Writers and Illustrators and the Minnesota Arts Board, first place in literary contests sponsored by the Loft Literary Center and also the Pacific Northwest Writers Association, and her chapter book, Taking Care of Trouble, received a South Carolina Children’s Choice Award. She currently lives in Bloomington, Minnesota.